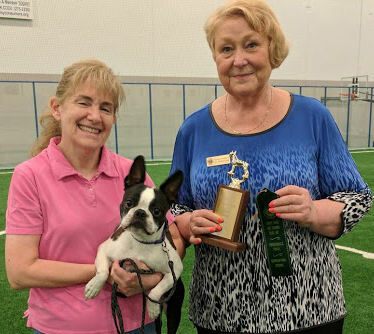 What is it about dog shows? Going to a dog show always energizes me. I think it’s because a dog show is so alien from most of our day-to-day lives. Most of us go to work every morning and sit. We spend our days looking at a computer screen or on the phone. Writing notes, completing spreadsheets, and not having much interaction with others. A dog show is very different. First of all, by its very nature, there are beings of a different species present! Lots of dogs… Most of them are happy and wagging their tails. (Although, personally, I don’t have much experience with tails.) Loud and panting, perhaps, but generally happy. The whole place is loud, usually, with people and dogs moving around. It’s very dynamic with lots of energy. Even at an obedience trial. Yesterday was the annual trial of the obedience club that I’m a member of. Even though it was a lot of hard work to put on the trial, I think each of us involved had a really good time. I know I did – and not just because of the ribbons! It’s the interaction between the people and the dogs. And just the fact that there are dogs there to pet and talk to makes the place happy. The energy of the place transfers to others. And Booker won the trophy for Highest Qualifying Scoring Boston Terrier at the trial! That’s me on the left and the judge on the right.